With an ever expanding website dedicated to the Peak District, the team at PDO welcome the latest addition to their Peak District wildlife section. The biggest bird of prey in the Peak District, the buzzard, flies in to land, adding to their most popular pages to date. Majestic and formidable, these imposing winged hunters are lethal it seems. With wonderful text, and stunning photographs taken by members of the team, Peak District Online unveil their latest page today. With growing numbers of buzzards flying around the Peak District, the team at PDO felt it was time to welcome them to their website. "We are so lucky to be able to see these gorgeous birds circling above our heads as we drive out and about," explains James Dobson, wildlife photographer and director for the peakapedia of knowledge all about the Peak District." They are such majestic creatures and if you're lucky enough to stop and watch one gliding high above you on the thermals, it's an experience you will certainly remember." Clearly very passionate about the Peak District, the director of the once small family one business which has grown into a monster website, listing the largest holiday accommodation directory for the area, James is also passionate about his wildlife photography. "It's so wonderful to be able to indulge in my hobby, taking wildlife and landscape photographs in and around my home up here in the gorgeous White Peak, but also being able to share it with readers of a website I hold very dear to my heart, http://www.peakdistrictonline.co.uk "
With lots of interesting facts and information about places to go, people to see and a wealth of knowledge, history and news about the Peak District, the team at Peak District Online are clearly clever at what they do. Attracting over 200,000 unique visitors each month and with the numbers growing steadily, it thanks to pages like the buzzard which add not only natural history, but excitement and enjoyment for readers. Judging by the huge number of emails and enquiries about signing up to the very popular newsletter service, the team will continue doing what they do. "Every time we launch a new page of the Peak District wildlife section we are very proud with the compliments we get. We're not infallible, and sometimes we do get the odd thing wrong which our readers and online viewers quickly point out and we rectify immediately, but it's so nice to know that our pages are enjoyed by so many. I think this latest page about the buzzard is probably my favourite, mainly because of the memories held behind each photograph," explains James.
" I get up most mornings just after dawn and a lot of the buzzard images were taken during last summer, so would have been captured on camera at about three or four o'clock in the morning. It's when the best light is, but also the most peaceful and quiet, which is the best time for any wildlife photographer to get up close and personal with the animal or bird they want to try and portray. Buzzards usually inhabit forests and areas of scattered woodland, but in the Peak District, buzzards are common sight circling above our glorious heather strewn moors and pastures in the White Peak. Watching them circle dramatically over the grit stone edges is a real photographer's delight and there's no other place in the country where such images can be captured." The latest page featuring the buzzard opens this week, only adding to and enhancing the Peak District wildlife section, which includes other birds of prey such as the barn owl, the kestrel, and the little owl, a creature prevalent in the White Peak close to where James lives. "There are lots more birds and animals on my list, so keep popping back to Peak District Online and I'll endeavour to capture them with my lens, and let the writers go to work with their facts and figures, finding wonderful research which bring my photographs to life." 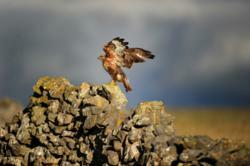 See the pages as they are added to the ever popular http://www.peakdistrictonline.co.uk and see the Buzzard in full glory.